Summer is an interesting time. For me it means my schedule fills with recreational commitments while my regular, work schedule, doesn't budge. Essentially I have to find the time to live 2 lives within the timeline of one. Unfortunately, as my family and friends will attest, I'm one of those people who typically let's responsibility outweigh elective invitations. That is to say I most often have to be drug kicking and screaming from my home, or computer, during the Summer. Even the thought of upcoming vacations and road trips expand my anxiety bubble. So, when one of my close friends asked me to help her build a storefront for her new business online I was quick to offer my help and equally immediately felt regret. While I had the skills to make her an amazing website the idea of chipping into my precious free time coding and fighting with domain hosts didn't exactly excite me. Then I came across one of the ads for GoDaddy's new GoCentral Website Builder, much like the one above. It promised to help me build a website in under an hour with easy code-free skills. Even better new users could start a FREE 30 day trial** with absolutely no credit card information. I'll admit, I'm one of those people who instantly tabs out the second I see I need to secure my credit card for something 'free'- so this was a huge motivator for me to log on and check it out. And, while Momma Told Me has been hosted by GoDaddy for 5 years now, a previously existing GoDaddy account is NOT necessary to take advantage of the trial. ***The Free Trial is an opportunity for you to use a GoDaddy Product free of charge for one (1) month, beginning on the date that you accept the Free Trial offer. The Free Trial will expire one (1) month from the date you accept the Free Trial offer, regardless of whether or not you use the Product during the Free Trial period. No credit card is necessary. The free trial is now available in all markets we sell the product. Helping build my friend's website was something I'd pushed off for over a month, but I was finally convinced I could tackle the task without giving up more than an hour of my precious Summer. In fact, having now used the GoCentral website builder platform I'm thrilled to know that the service is so user-friendly and non skill reliant that she will be able to maintain, edit, and build her website entirely on her own in the future! For anyone ever dubbed 'that techie friend' you can certainly sympathize with how big a win it is to assist someone with setting something up and the sheer relief of knowing they will be able to handle and maintain it once you hand it over. So let's take a look at the GoCentral, powdered by GoDaddy, website building process, shall we? You'll start by logging into GoCentral with your existing GoDaddy information OR by setting up a free GoCentral account in just a few painless questions. No payment information is required or requested to set up an account or start your trial. Next I was taken to a pretty generic front page mock-up. I did note that GoCentral had auto-populated some jewelry themed graphics into the backgrounds and buttons as a nice touch. Stock images are available at no extra charge and can really help website builders get their site up and running for utility purposes, immediately. Since GoCentral is a living breathing website building wizard (tool) you can easily hop on and make edits to your live site without a disruption of service. If you really want to get a site live in a matter of minutes you truly can thanks to the easy to use templates. I wasn't a fan of the initial layout theme so I browsed some other options and chose one that worked for me. In addition to the physical layout/presentation of the main page I had the choice to choose accent colors, font styles, and more to really mold the page to my brand/topic. It was easy to swap the stock background image for one of our own, with a built in sizing/cropping tool and the option to add logos or extra action buttons. Because my friend's business had initially began on Facebook (since she had no startup or method of creating a physical online storefront) I added an action button which would direct new customers to her Facebook Group from the main page. It was as simple as giving the button a title and pasting the destination link into the template on the right of the screen. The template I'd chosen offered a free scrolling site layout with a cascading page organization at the top. I could easily add pages/tabs to the website then choose from 'section' templates which would auto-fill various dummy elements based on the section's theme. These section templates suggested everything from a blog format or interactive calendar widget to a photo gallery and eCommerce features. The first thing I knew her site needed was a Contact Us section, which was conveniently auto-populated as a page, thanks to the 'Jewelry Designer' category I had chosen initially. Since she operates her business solely online I dropped the physical business hours and put another shout-out to her original Facebook sales group. Next, since it's an online storefront, I had to add some sort of inventory. For eCommerce features I was given 2 initial options under the 'Sell Online' section, 'Online Store' and 'Paypal Button'. 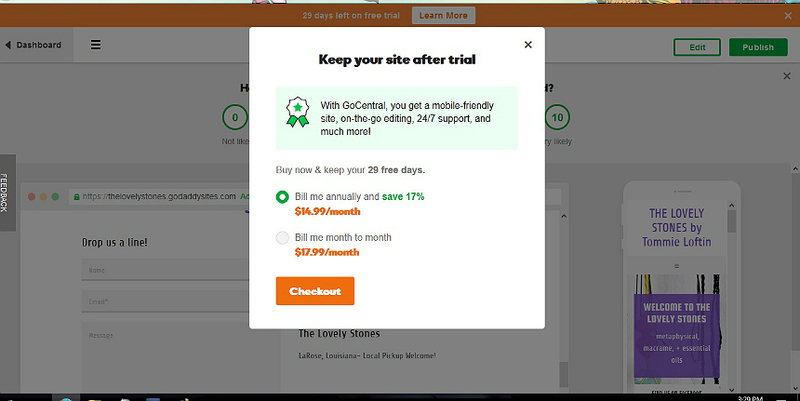 I wanted to look a little into the 'Online Store' functions but this was classified as an upgrade and prompted me to cal GoDaddy to upgrade my trial. Instead I used my friend's existing PayPal information to set up basic listings for her items, each item housing it's own PayPal button. I could easily add a product image, title, cost, shipping cost, and description to each section. Because this was so easy, and took less than a minute for each product, I was also able to create different tabs/pages for each category of product to better organize her inventory for easy shopping. I hadn't really thought of everything I wanted the website to have so it was especially useful to have the 'Section' categories suggested by GoCentral.Under the Content tab there was a mention of an FAQ page- something every business should have. I especially loved how easy it was to select and integrate into the website. I played with a few templates at first, which I didn't like, and found it very easy to delete entire sections, elements, or make edits on the fly. GoCentral is very user friendly in it's website builder platform but still offers the clean structure of initial templates to guide you towards a better website. One of the things I've always found overwhelming with website building in the past was the lack of guardrails- I could put anything anywhere and that often ended up looking quite over-crowded and messy. GoCentral allows for a distinct voice and style while still maintaining a professional face on the internet. Best of all, you don't ever have to touch coding. Once I had The Lovely Stones designed about how I wanted it I could preview both the mobile and PC versions. With my own blog I had to pay someone to come in and code my mobile site so it would be easy to navigate on phones and tablets. GoCentral has worked this right in- your site will automatically be user friendly on mobile! The 30 day trial will allow you to maintain your new site, and the attached web address(at .godaddysites.com) for the entire 30 days but your site will be disabled at the end if you do not choose to subscribe. To be quite honest, if I'd had the GoCentral platform when I began blogging I would have happily paid the GoCentral subscription price for the ability to easily transform and personalize my living website without the fuss and expenses of professionals and coding. Everytime I want something changed on my blog it costs me money and down time. With GoCentral users can instantly tinker with their content with no disruptions or extra fees. You can even purchase a unique domain name for your GoCentral website, if you want to ditch the .godaddysites.com URL. So you want to see the finished product? I have to admit my friend was quite impressed. I believe the words she used were 'that's freaking awesome' and 'it's so professional!' We have a few back end things to work on (taking photos that are larger resolution for display on the computer, for example) but the website functions as a living breathing storefront and gives a clear impression of her and her business. 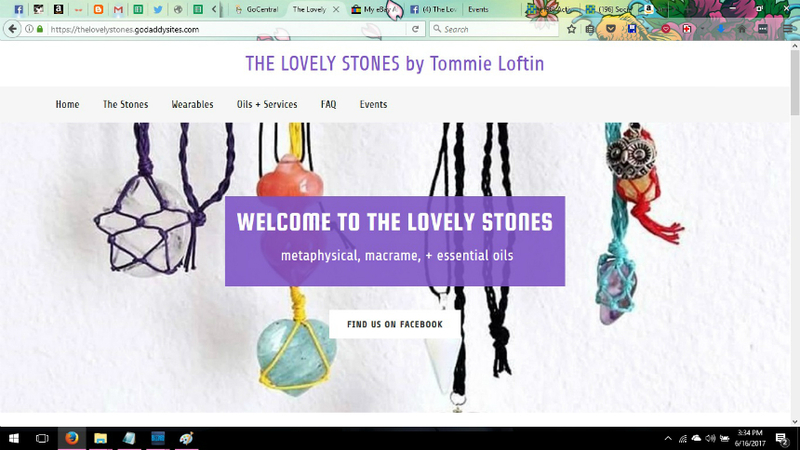 Check out The Lovely Stones, thanks to GoDaddy's GoCentral! 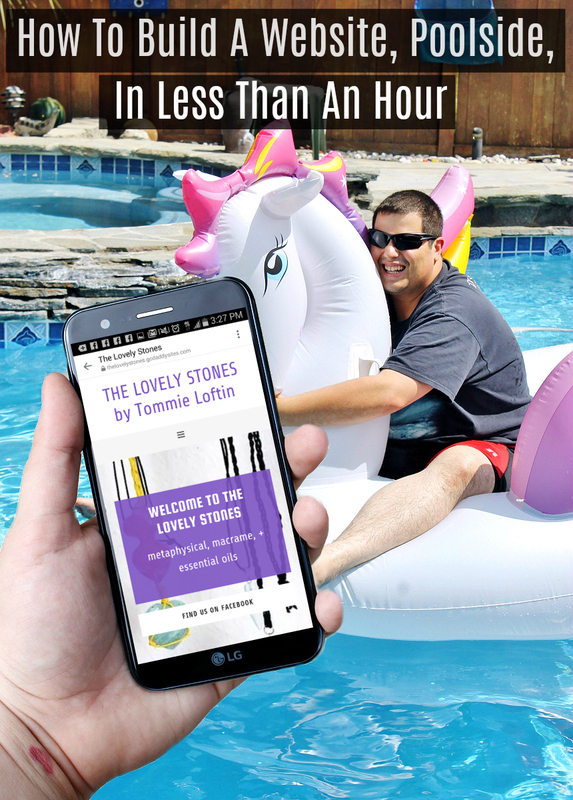 So there you have it- I created a storefront website with eCommerce features in less than 40 minutes, poolside. Even better I've made some edits and tweaks on the go through my phone! While the service and platform are here to stay the FREE Trial Offer is not so be sure to take advantage of your 1 Month Free Trial with GoDaddy's GoCentral Website Builder before the deal ends on August 11, 2017! GoCentral's website builder really is something you have to experience to understand how easy it is to use, and there is no credit card or payment required to get you on and playing with GoCentral today. Now, tell me, do you have a website of your own? If not, what would your website be about if you did? Well that sounds easy peasy! My husband was talking about setting up a website, so I have to show him this. I love that you were able to do ALL this poolside! As someone who works on websites, I love how easy this is for those who need it most! What an awesome write up! I have a friend who has been wanting to start her own website for awhile now, but she isn't tech savvy, this makes it sound so easy that anyone can set up a website. OMG that photo in the front is priceless! Get it girl! Poolside is my favorite type of work! I like when things are easy to set up, that way I don't have to go get my husband to help me. Then he asks me too many questions as to why I want this or that. This sounds great and easy. GoDaddy usually is. I'm going to be giving this a shot. I am hosted by GoDaddy and I really like them. I have been with the for over two years and have never had a problem. I love how easy they make it to set up your website with Go Central. I have GoDaddy for my site and I love it. They're always very helpful and it's easy to use. We love GoDaddy in this house. Its such a user friendly site. I love the idea of working by the pool! You are a great friend to help your friend set up a website - and it looks fantastic. This sounds like a great way to set up a website. I would love to be able to do it while I am relaxing by the pool. Your friend will be so happy! It is so easy to edit these GoDaddy Sites as well. Adding products will be a breeze for her. A website builder helps you create your site like a pro with no experience needed.